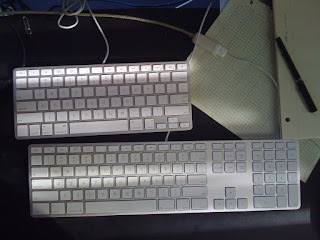 I think I’ve requested a rationally sized keyboard several times over the years, so when Apple finally came out with one, I figured I needed to put my money where my mouth is, and buy one. I plugged it into a KVM, and it works fine (typing on either a 20 inch aluminum iMac running Mac OS X 10.5.6, or a G5 tower running 10.4.11). As with my MacBook Air, I missed the Enter key. So I installed KeyRemap4MacBook. Despite the name, it works fine with the Apple Keyboard as well as the MacBook Air. The only problem was that for some reason, I wanted to put my right hand too far to the left —apparently I’m too used to positioning it away from the right side of the keyboard. It’s really nice having all that desk space back! Hallelujah! Apple is once again offering a keyboard that doesn’t take up excess space on your desktop, and will work without draining batteries!